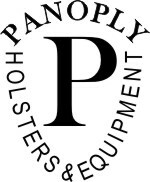 "Useful Equipment for Useful People"
As with all Panoply Holsters the #1 will give you a lifetime of service. It may look unique, but it's design is actually a refinement of several long serving principles in holster making. Two separate steel reinforcements keep the mouth open when the gun is withdrawn regardless of how much you cinch down your belt. At the same time using two pieces of steel reduce weight while still allowing you to keep the desired tension on the gun throughout the life of the holster. The skirt extending from the front and the wide single belt loop (a hole is cut in the underside to allow a pants belt loop to pass through if desired, locking it in place) provide superb stability during the draw and holstering. Unlike normal behind the hip holsters it wants to stay in place when you draw rather than riding up with the belt. Reversing the fold so the skirt is toward the front has several benefits. It provides a built in sight channel and stitch free path so the ejection port doesn't catch on the draw, this slowly destroys a holster and always seems to catch your draw when time is most critical. Our design creates a large flat portion on the holster to ride against the body, this combined with the skirt disperse the pressure against the body making it an exceptionally comfortable and stable holster. Many users of IWB behind the hip holsters find they must constantly pull up or adjust their pants throughout the day. The comfort and stability inherent in this holster's construction go a long way in reducing your need to regularly adjust its position. A traditional muzzle rearward cant provides time tested concealment. This holster will provide you with the comfort and reliability needed for a long day.